Ed Carpenter will start from the pole of the Indianapolis 500 Mile Race for the second year in a row. The 33-car field is the fastest in Indianapolis 500 history (229.382 mph), breaking the previous record of 228.648 mph set in 2002. The owner/driver of the No. 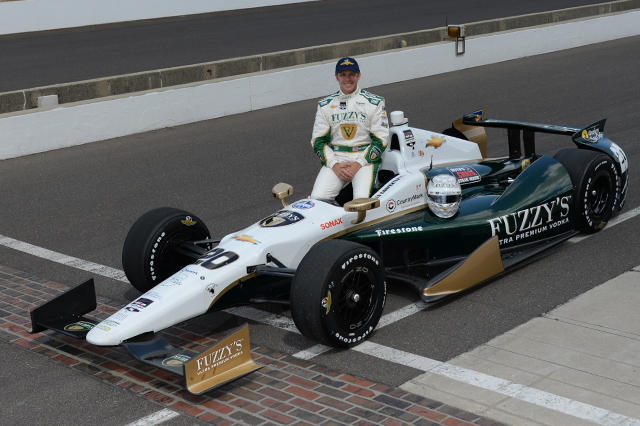 20 Fuzzy’s Vodka/Ed Carpenter Racing Chevrolet was the final qualifier May 18 and recorded a four-lap average of 231.067 mph to bump James Hinchcliffe from the top spot and claim the $100,000 Verizon P1 Award for the 98th Running of the Indianapolis 500. Carpenter is the 11th driver to earn back-to-back poles for the Indianapolis 500 — the most recent Helio Castroneves in 2009-10. Carpenter’s four-lap average was the fastest since 2003, when Castroneves won the pole (231.725 mph) and was the race runner-up. 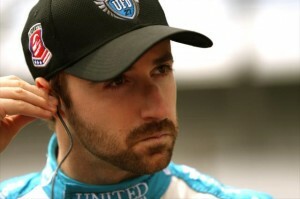 Carpenter earned the Verizon P1 Award last May with a four-lap average speed of 228.762 mph. The Fast Nine Shootout closed two intriguing days of qualifications under a new format that set the field May 17 and determined starting positions May 18. Juan Pablo Montoya recorded a four-lap average of 231.007 mph average in the No. 2 Verizon Team Penske car to lead the qualifiers for positions 10-33. 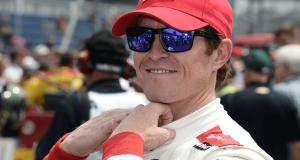 He’ll be on Row 4 with reigning Verizon IndyCar Series champion and 2008 Indy 500 winner Scott Dixon (230.928 mph average) in the No. 9 Target Chip Ganassi Racing car and first-year competitor Kurt Busch (230.027) in the No. 26 Suretone car for Andretti Autosport. Six of those 24 qualifiers registered four-lap averages above 230 mph, and all but four bettered their average speed from Round 1. Row 11 features the youngest – 19-year-old Sage Karam – and oldest – 46-year-old Buddy Lazier – alongside Sebastian Saavedra, who will be 24 on June 2. The difference in time between Carpenter and Lazier (2.1509 seconds) is the closest field by time in the history of the Indianapolis 500. The previous closest was 2.5399 seconds in 2011. The difference in speed between Carpenter and Lazier (3.147 mph) is the second-closest field by speed in the history of the race. The closest was 3.130 mph in 1953. 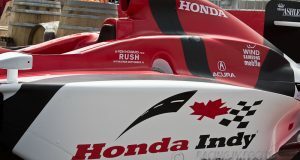 Hinchcliffe, who eight days earlier suffered a concussion in the Grand Prix of Indianapolis and was cleared to drive May 15, registered a fast lap of 231.618 mph on his first lap in the session and averaged 230.839 mph in the No. 27 United Fiber & Data car. Will Power (230.697 average) will start on the outside of Row 1 — his second front-row start. Castroneves, seeking his fourth Indy 500 victory, recorded the fastest qualifying lap of the two days (231.671) in the Fast Nine Shootout in the No. 3 Pennzoil Ultra Platinum Team Penske car. Simon Pagenaud (230.614) and Marco Andretti (230.544), who qualified third last year, will join Castroneves on Row 2. Carlos Munoz, who started and finished second last year as a rookie, qualified on the inside of Row 3 (230.146) in the No. 34 Cinsay AndrettiTV.com HVM car. Josef Newgarden, in his third season with Sarah Fisher Hartman Racing, qualified eighth (229.893) and JR Hildebrand (228.726), the 2011 race runner-up as a rookie and the first qualifier in this session, qualified ninth.